One of the aspect of SEO (Search Engine Optimization) is canonicalization. Canonicalization is the process of picking the best URL when there are several choices according to Matt Cutts, the head of Google’s Webspam team. If you have multiple ways of reaching your web page (as above), then you need to sit down because it is time to make some decisions my friends. 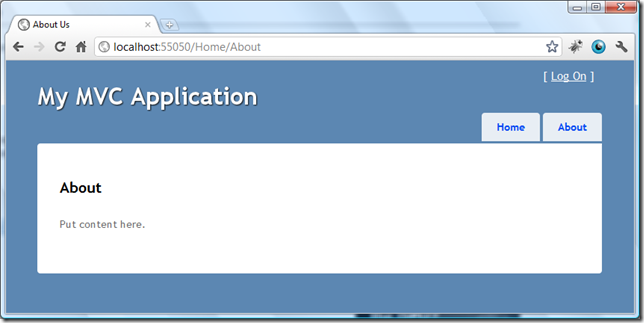 Let’s assume that we have created a web application, an ASP.NET MVC app because we are so cool. We have our pretty URLs as well. We have got the same page content. As we have mentioned before, these two will be treated as two different web page and it will confuse the search engine a bit (even if they are so smart today). The solution is pretty simple : when a page is requested with trailing slash, then make a 301 (permanent) redirect to the non-trailing-slash version. You could write your own HttpModule to handle this. You could do a poor man’s redirection on your controller (on your page load if the application is a web forms application). You could use IIS URL Rewrite Module to easily handle this. 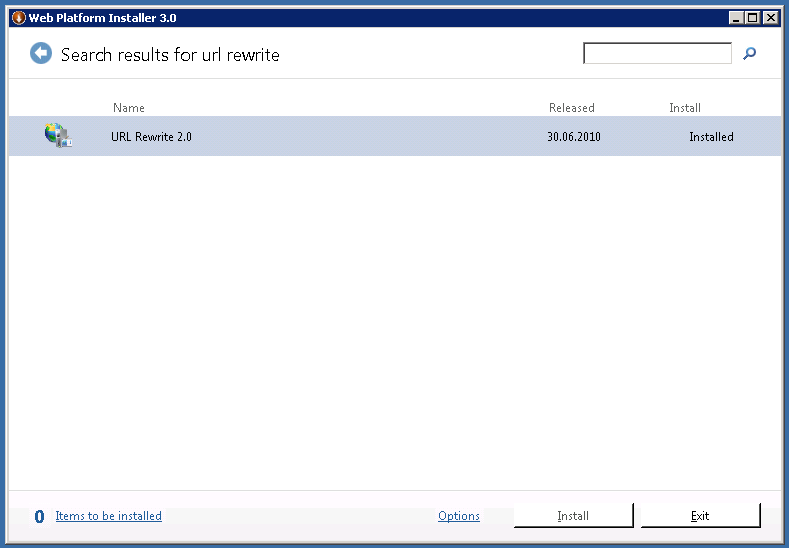 In this quick blog post, I will show how we can implement this feature for our whole web site with IIS Rewrite Module. Now, we are all set up and ready to implement this feature. As it is usual nearly for all Microsoft products, there are thousands (ok, not thousand but still) of way to approach this feature but the easiest way of implementing it is to write the logic inside your web.config file. What this code does is to tell the module to remove the trailing slash from the url if there is one and make 301 permanent redirect to the new URL. Isn’t that awesome? A little effort and perfectly clean way of implementing the 1 of a thousand parts of canonicalization. In your development environment, if you run your web site under Visual Studio Development Sever, you won’t be able to see this feature working. 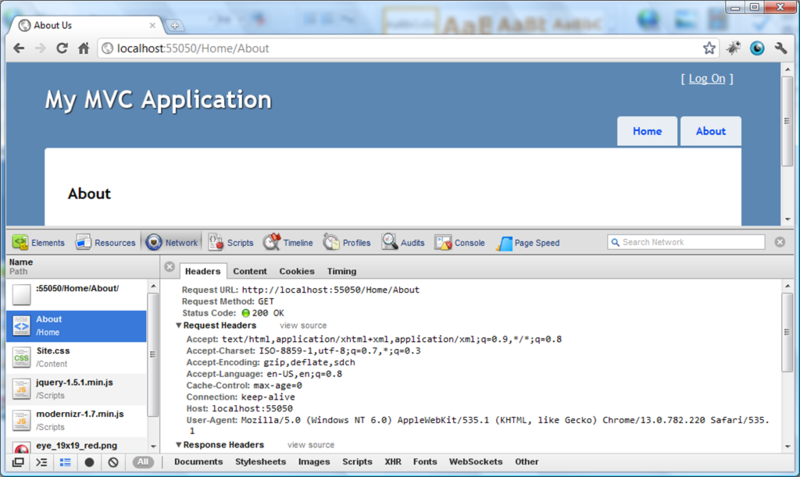 You need to configure your application to run under at least IIS Express to see this feature working. When you deploy your web site and see this feature not working on your server, it is highly possible that you misconfigured something on your server. One of the misconfiguration you might have done could be setting the overrideModeDefault attribute to Deny for rules under <sectionGroup name="rewrite"> inside your applicationHost.config file. If you are on a shared hosting environment and you see this feature not working, then ask your provider if they have given you the permission of configuring this part. Have you ever used 'MSDeploy' inside Visual Studio 2010 and wished a nice process bar while publishing a web application? There is even a better way! 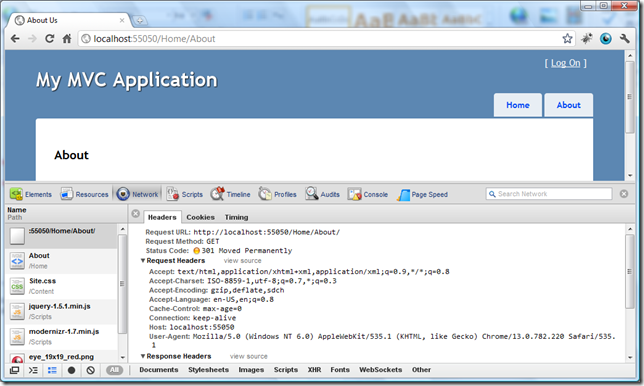 Deployment of your web application is not hard anymore. It is so much easier than before with 'MSDeploy'. MSDeploy was introduced to us with Visual Studio 2010. It takes all the application and publish it how we want. I am not going to explain what MsDeploy is and how it works. This is bot the topic here. I assumed that you are reading this post because you have had a least one or two experience with MSDeploy inside Visual Studio 2010. When we are publishing an application with one click publish button, you probably noticed a little green world icon with coming and going tiny things on the left bottom side. That think is showing the process of your publishing but not so much informative. I thought that would be cool to view the remaining time of the process but Visual Studio has a lot better feature which I didn’t know until last night! Indeed, we have a chance to view the process file by file from output window of visual studio 2010 while publishing your application. That is pretty darn cool. But how we can configure this feature so that we could be able to view that. We need to go over to Tools > Options. Then expend the Projects and Solution section from the list on the window. You will find Build and Run section under that which will give you a window which will look like as it is here on the left. 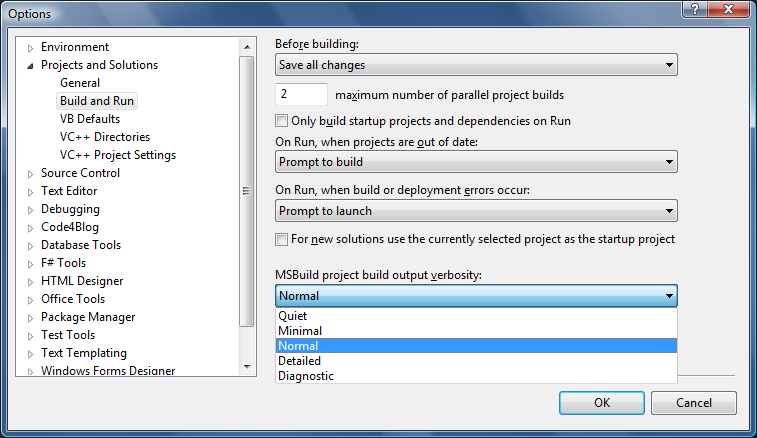 You notice that there is an option called 'MsBuild project build output verbosity'. There are five options there and it is set to Minimal by default. I changed it to Normal which is enough for our purpose here. Solution to an annoying error message! You are getting 'Could not write to output file 'c:\Windows\Microsoft.NET\Framework\....' message? You are at the right place. Temporary ASP.NET Files folder (c:\Windows\Microsoft.NET\Framework\v4.0.30319\Temporary ASP.NET Files) was the the one with the problem here. First, I thought that the problem is related to security permissions on the folder and I was right. I right clicked on the Temporary ASP.NET Files folder and go to the security tab. I noticed that there is user called IIS_IUSRS and that guy has the full control permission. But apparently that was not enough. Once you applied those setting, restart your IIS and try to run your application again. The error should be gone by now. I suffered a lot by trying to find the right method for the problem and I hope you didn’t have to go through hell over this. I wrote a blog post on “Deployment of ASP.Net MVC 3 RC 2 Application on a Shared Hosting Environment Without Begging The Hosting Company” couple of months ago. The solution was working for most case scenarios if the server is configured properly for ASP.NET Routing. 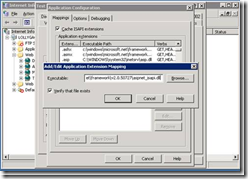 Other working case I have seen was the applications which are running under IIS 7.0 integrated mode. 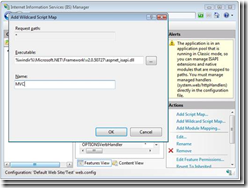 Under IIS 7.0 integrated mode, no special configuration necessary to use ASP.NET Routing. As we know, one of the most beautiful parts of ASP.NET MVC framework is Routing. We have nice, clean, extensionless URLs thanks to routing and this is becoming an issue under IIS 6.0 and IIS 7.0 classic mode. When we typing the path of a web site page inside the address bar of our web browser, we are making a request against server. If our web application is running under any version of IIS, the request hits ASP.NET framework on certain conditions. 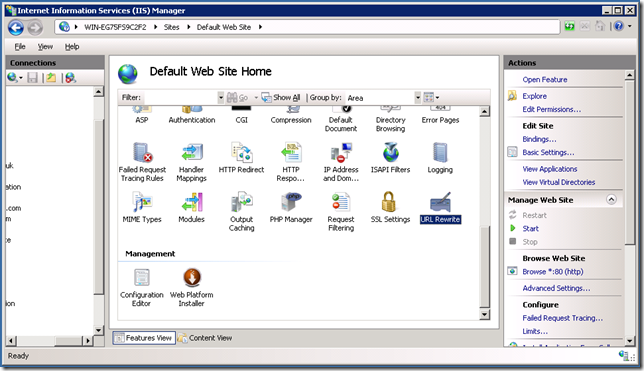 Especially, Older versions of IIS only map certain requests to the ASP.NET framework. If the extension of the web request is aspx, ashx, axd or any other extensions which is specific for ASP.NET framework are being mapped to ASP.NET framework. 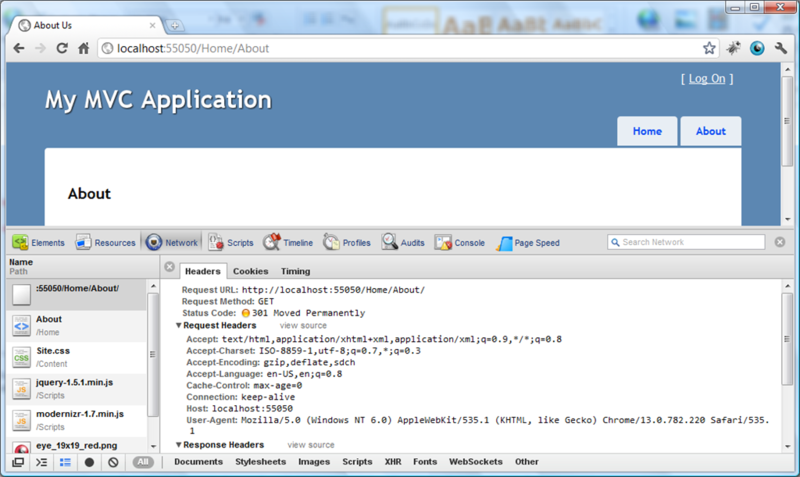 So, in a MVC application the requests are not being mapped to ASP.NET framework. No, do not throw away your precious, new born ASP.NET MVC application which you have created working along with Nuget PMC (which is perfect), EFCodeFirst and any other cool newbie stuff. There are optional solutions for this problem and they are not like hard things to implement. If you have full access over your server, you could create so called Wildcard Script Map so that you can use the default ASP.NET MVC route table with IIS 7.0 (in classic mode) or IIS 6.0. 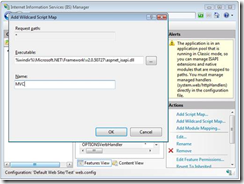 This Wildcard Script Map will map all requests to the web server to the ASP.NET framework. I have no experience with this option, though. I had a problem like this within this week, I have solved it with the following option and didn’t want to use this one even if I have full control over my server. I am not a server pro, so I won’t be making any comments on how this will effect the requests flow made against your server. I just thought that “man, every single request which made against my server will be mapped to ASP.NET framework. This could effect the speed of the delivery process.” and that how I skipped this option. We will simply add Extensions to the Route Table so that older versions of IIS can pass requests to the ASP.NET framework. 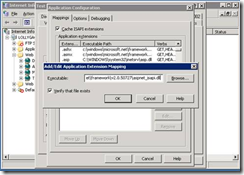 This option requires changes inside Global.asax file of you application and some addition work on IIS for modifying the Default route so that it includes a file extension that is mapped to the ASP.NET framework. Here, we are assigning .mvc extension for every URL for controller name. I want to warn you about your links inside your views. If you created them by hard coding, now you are officially screwed my friend. Because, you either have to change all of them by hand or need to implement option 1 in order to keep them unbreakable. 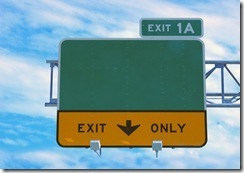 If you used ActionLink or RouteLink kind of way, then your are good to go. 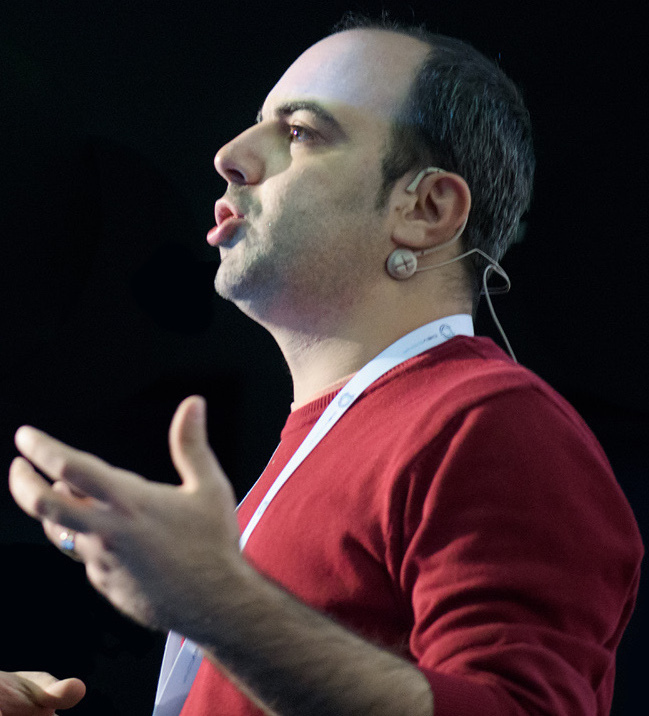 Changes will be handled by MVC Framework for you. Therefore, to get ASP.NET Routing to work, we must modify the Default route so that it includes a file extension that is mapped to the ASP.NET framework. This is done using a script named registermvc.wsf. It was included with the ASP.NET MVC 1 release in C:\Program Files\Microsoft ASP.NET\ASP.NET MVC 1.0\Scripts, but as of ASP.NET 2 this script has been moved to the ASP.NET Futures, available at http://aspnet.codeplex.com/releases/view/39978. 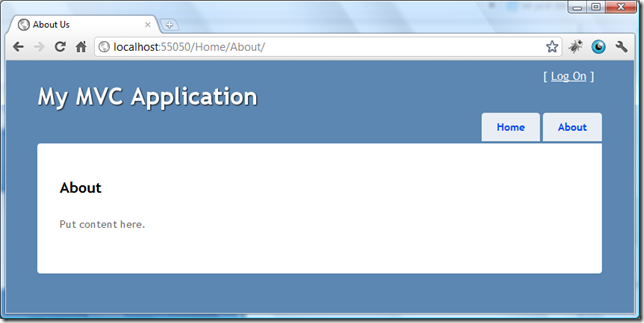 Executing this script registers a new .mvc extension with IIS. After you register the .mvc extension, you can modify your routes in the Global.asax file so that the routes use the .mvc extension. Look at line 7. Isn’t it familiar? 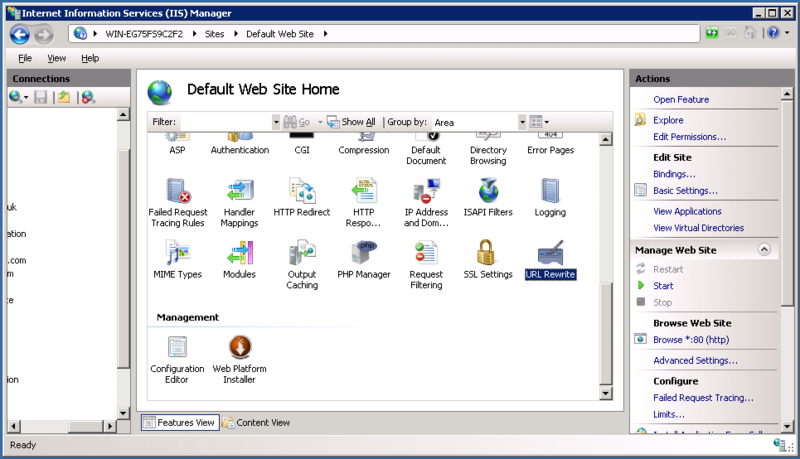 It is one of the ASP.NET framework extensions. You could add .aspx or whatever you want from ASP.NET framework extensions. It is already registered into the Default route so the requests will be mapped to the ASP.NET framework. I hope that this is the solution you are looking for your problem. I have wrote another blog post on ASP.NET MVC Deployment problems you might have related to your server. If you are still having problems (especially, if you are getting 404 exceptions for extensionless URLs), you might want to have a look at on "Running ASP.NET MVC Under IIS 6.0 and IIS 7.0 Classic Mode : Solution to Routing Problem"
On the 10th of December in 2010, Microsoft ASP.Net MVC team has released the MVC 3 RC 2 and it has some good stuff inside which RC 1 didn't have. It is not so much different but there are some breaking changes, especially ViewBag thing. You could find more information about ASP.Net MVC RC 3 goodies on ScootGu's blog post or Phil Haacked blog post. 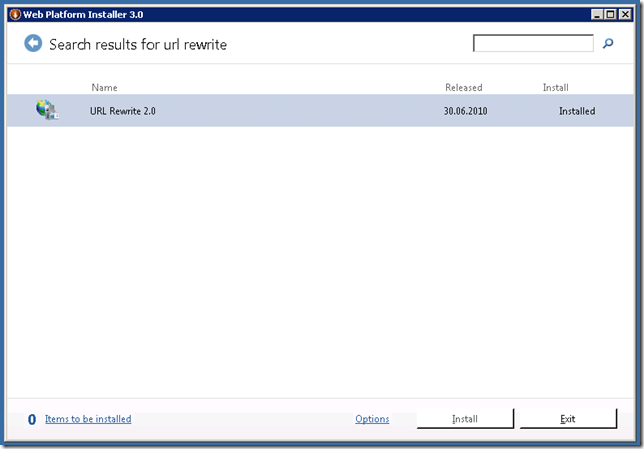 The MVC 3 RC 2 has come from go-live-license so you can use this in production if you wish. But the main problem rises here if you are in a shared hosting environment. As you know, shared hosting providers are not willing to install the new releases unless it is for sure that there is no detected bug in the package. I thought that would be a big problem for me [because I am still in shared hosting environment :)] but deploying the necessary assemblies as manually is the solution. 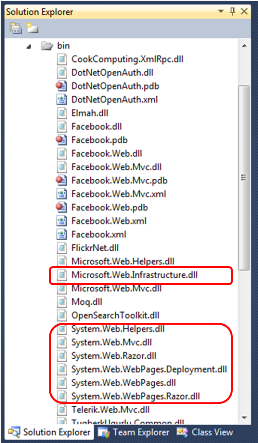 Scott Hanselman has a great post on how to deploy an MVC 3 application into a shared hosting environment. The article covers all the necessary steps. One problem is that if you do exactly as it is there, you will sure have a problem if you are deploying the RC 2 of the MVC 3. Could not load file or assembly 'System.Web.WebPages.Deployment, Version=1.0.0.0, Culture=neutral, PublicKeyToken=31bf3856ad364e35' or one of its dependencies. The system cannot find the file specified. We have all the necessary files in our hands and so what now ! 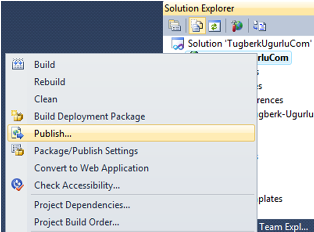 I used built in Visual Studio Publish tool to publish my application to the production side. After publishing was complated, I simply copied those 7 dll files into the bin folder inside the root directory of my application.